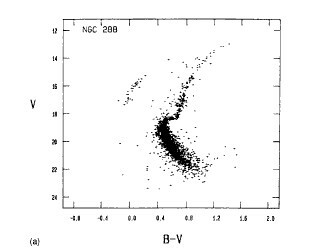 NGC 288 attracted attention of astronomers in the late 1980s when it was compared with the otherwise similar globular cluster NGC 362 on about the same right ascension (but much more southern), and found that NGC 288 must be about 3 billion years older. This result was found because of differences in the color-magnitude diagrams: The so-called Horizontal Branch of NGC 288 is bluer, and the turnoff point of the main sequence (hottest/bluest/most massive main sequence stars) is redder (and fainter). Binocular observers can view NGC 288 together with the bright galaxy NGC 253 in one field; NGC 288 appears as a round nebulous object. Telescopes of 4 or 6 inches aperture resolve this cluster, provided the observer is located sufficiently south. The rather poor concentration of this cluster is indicated by its classification in class X.
Sahu, Snehalata; Subramaniam, Annapurni; Cote', Patrick; Rao, N. Kameswara; Stetson, Peter B.